A dog leg left par 4 that plays way longer than its length. 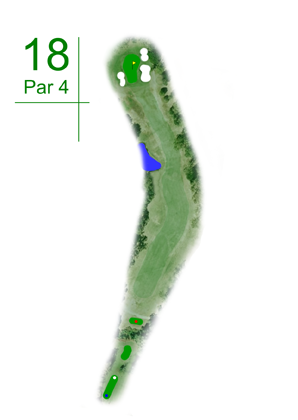 Awkward tee shot in the sense that driver for many players is too long and ends up in the hazard or trees. On the other hand if you are too conservative and leave yourself a 150 metre second shot it will play as 170 uphill to a narrow well bunkered undulating green where 4 putts are not uncommon.